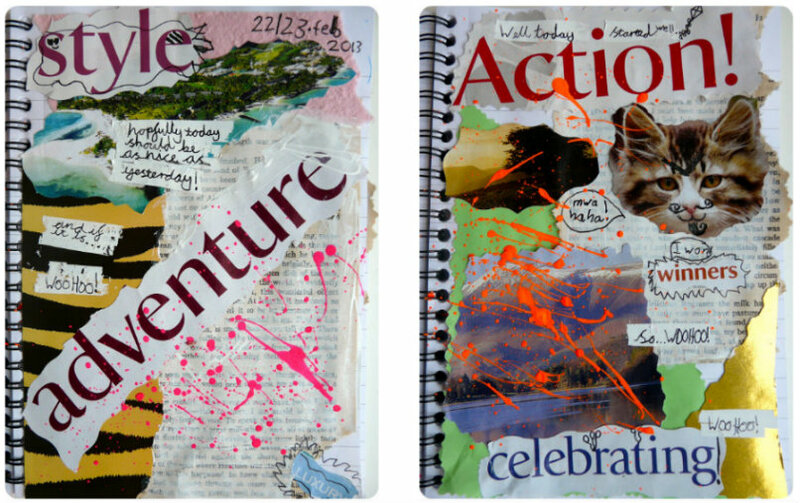 Art journaling is a wonderfully free form of self-expression. 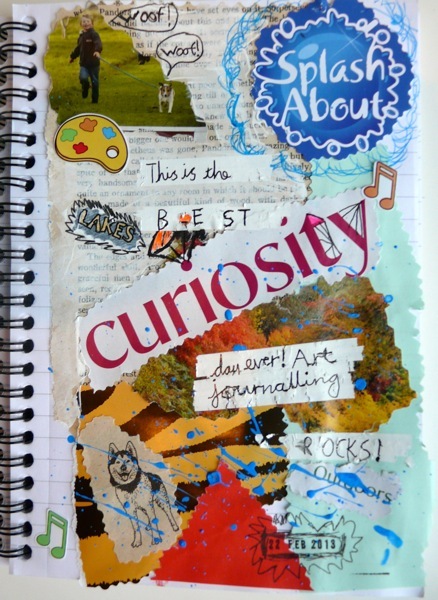 The very definition of “journal” – a daily record of personal experiences – seems to bring with it the permission to create whatever you feel like creating at that moment in time – not the perfect piece of art designed to please others for all time. 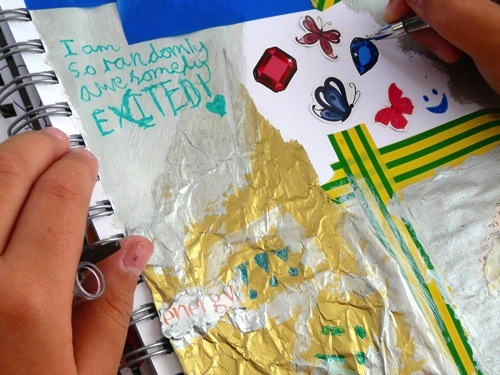 Art journaling is also a fun way to build kids’ confidence in using mixed-media. It might even inspire writing! 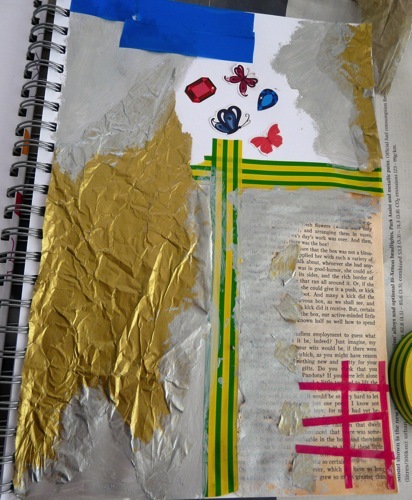 When I art journal alongside my kids, my role is to offer exposure to new ideas, techniques and sources of inspiration. 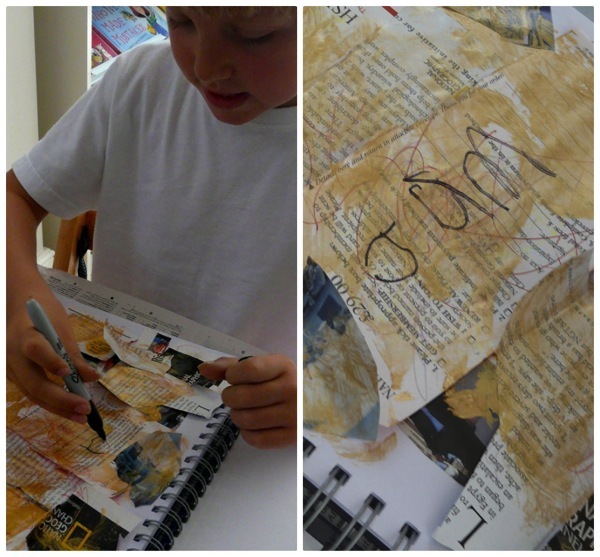 We began art journaling by following the simple process described at Notes on Paper. 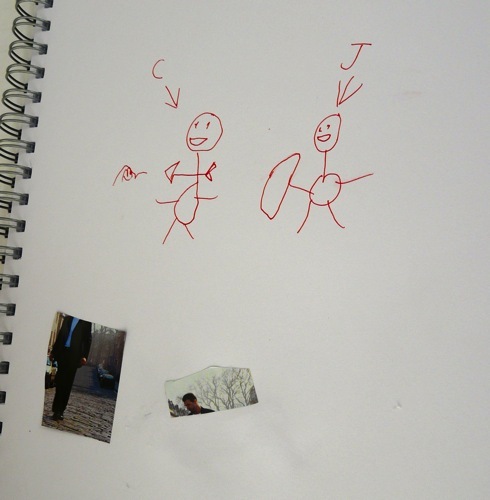 Since then, C(9) has created many pages in a similar way. C(9) and I spent a happy hour or so chatting over our pages as we worked. J(8), meanwhile, enjoyed himself thoroughly and was done within ten minutes. 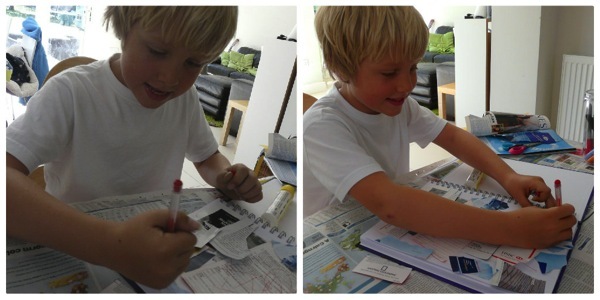 Have you ever noticed how scissors and gel pens are completely different tools in a boy’s hands? 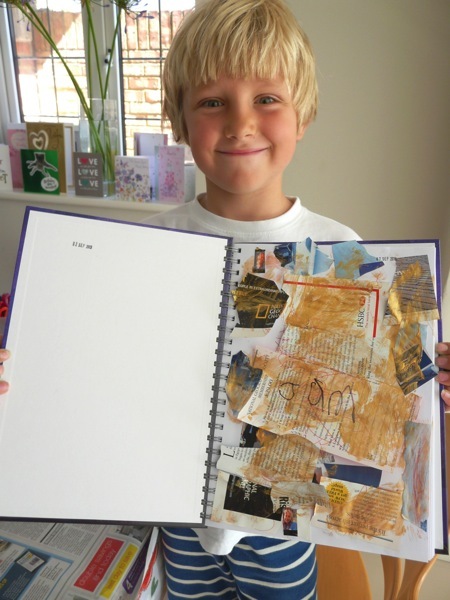 Have you ever tried art journaling with your children? 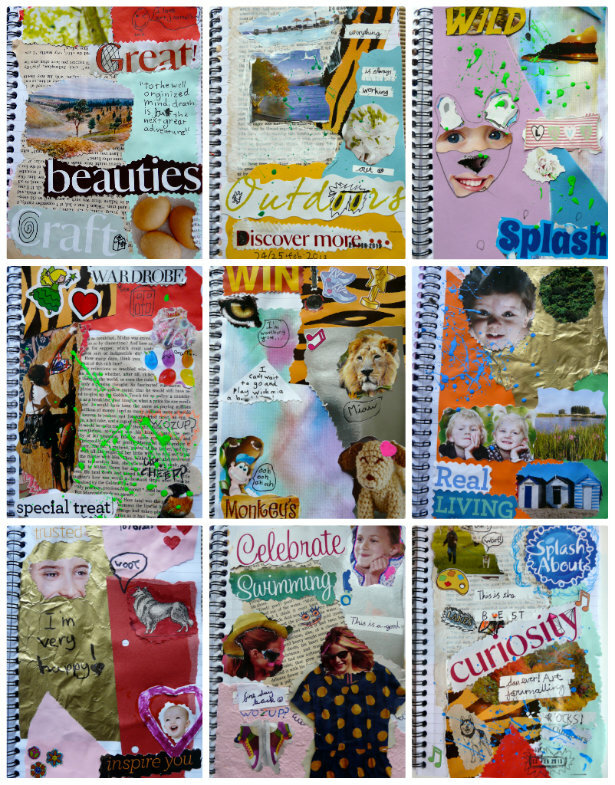 Nicole at One Magnificent Obsession – Road Trip Journalling! 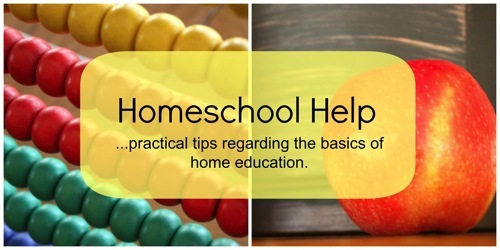 Homeschool Mother’s Journal – So You Call Yourself a Homeschooler? 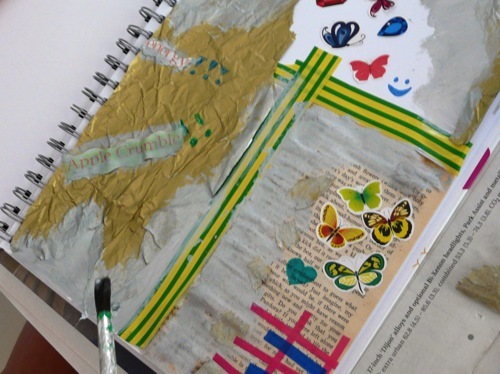 It’s a journal for using your art to express your memories, dreams, and thoughts. How you create the images, and what type of imagery you make, is entirely a matter of personal choice. There are no rules. You can paint or draw, use pen and ink, photos, collage, doodle, stickers… anything and everything. 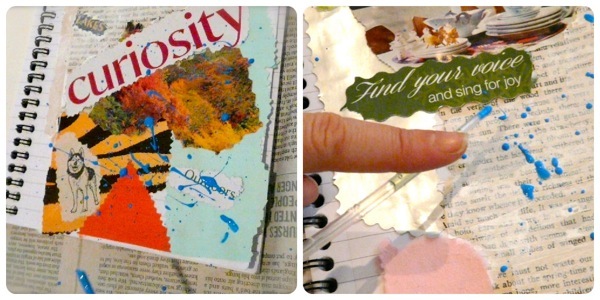 Doesn’t art journalling sound wonderful? 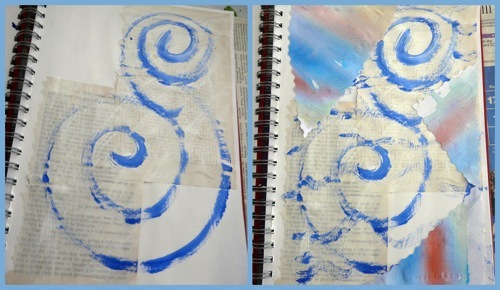 Inspired by this beautiful post at Notes on Paper on how to make an art journal page, I was eager to try it out. C(9) and I had the perfect opportunity to do so on Friday while J(7) was on a sports camp. 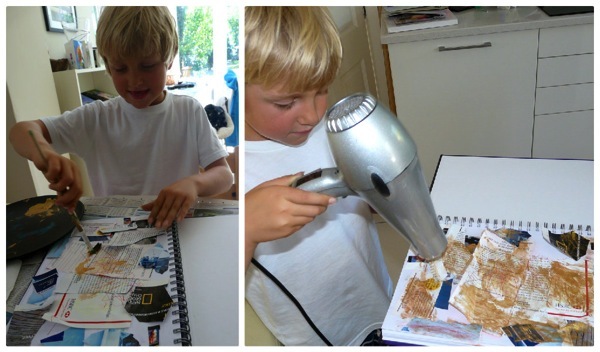 I think J will enjoy art journalling too, but at his age he’ll be most inspired by seeing tangible examples before he does it himself. Step 1: Prepare a base layer with mixed papers. 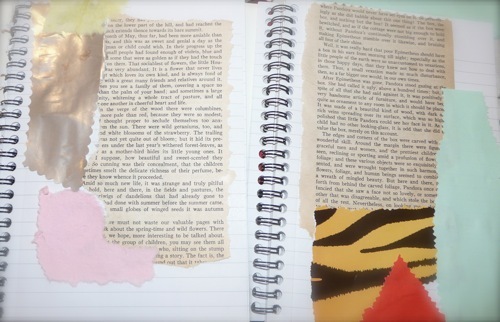 We used pages torn from an old novel and other scraps, and glued them randomly to the page. 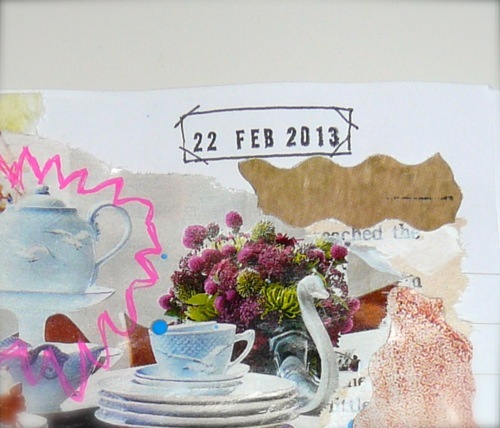 Step 2: Gather images from magazines and catalogues to create a theme for your page. Glue them onto your page. 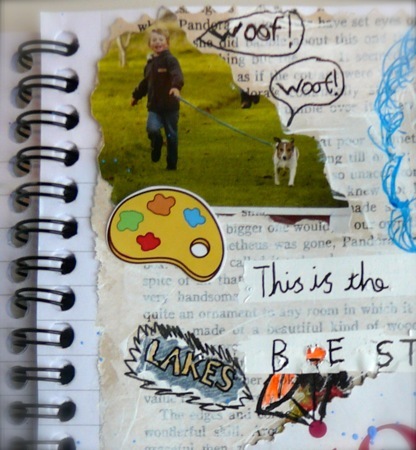 Step 3: Add any extra scraps of paper etc in colours which complement the images you’ve chosen. 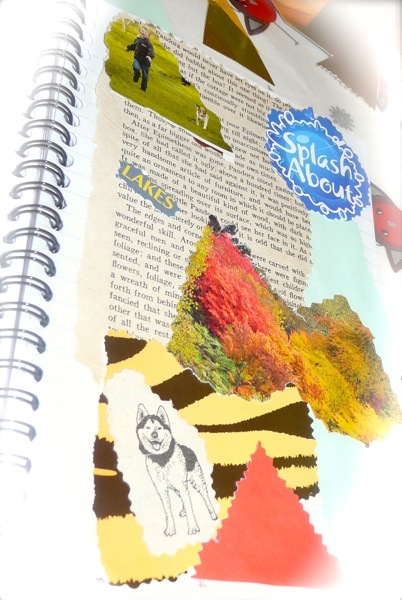 Step 4: Flick through your magazines and catalogues again, this time looking for words that suit the mood of your page. Maybe put together the words in new ways. Overlap words and images to enhance your composition. 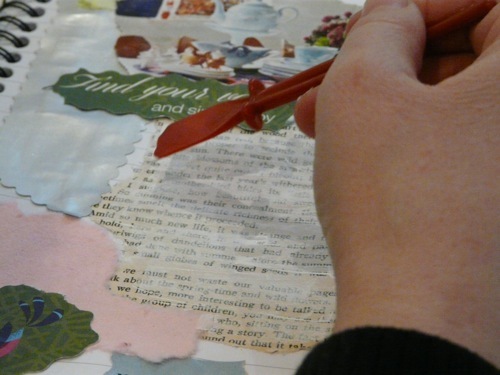 Step 5: Cover some of the text with a thin layer of white acrylic paint, using a glue spreader. This was my favourite step. Doing it made me feel like a “real” artist! 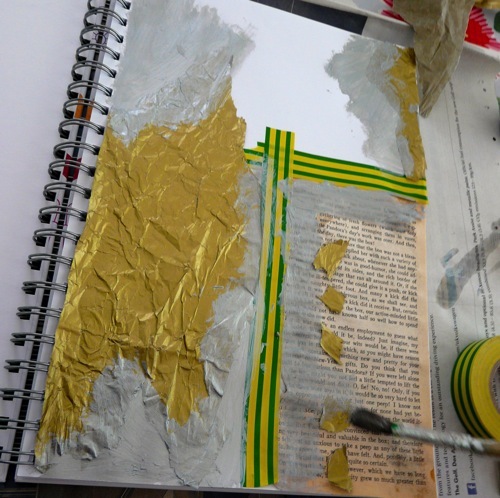 Step 6: Flick paint at the page! Notes on Paper suggests ink, but as we didn’t have any, paint worked fine. We used a pipette. Best do this with a sheet of newspaper underneath, we found out! Spatter the page with ink! Julie mentions these type of stickers, which look very tempting. We used stickers we’ve collected over the years, mostly from kids’ comics. 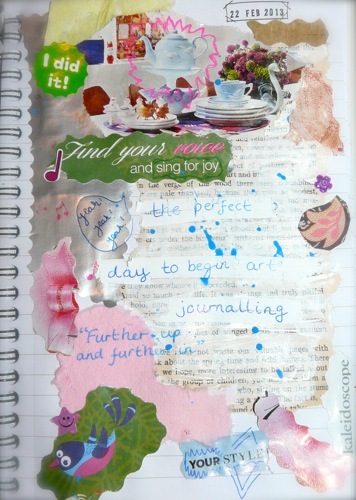 Step 10: Date your journal page. We copied Julie and used a date stamp. After she’d finished her page C leapt around the house joyfully exclaiming “this is the best day EVER! 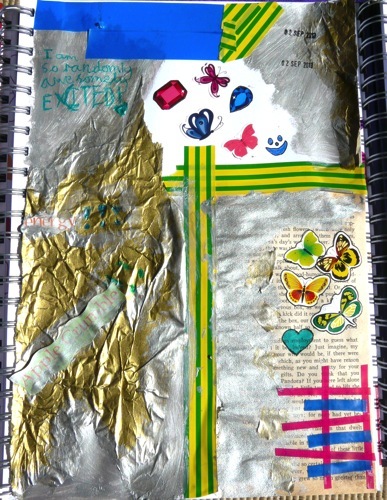 I LOVE art journalling!” Since then she’s made several more journal pages and says she wants to do art journalling as a project. 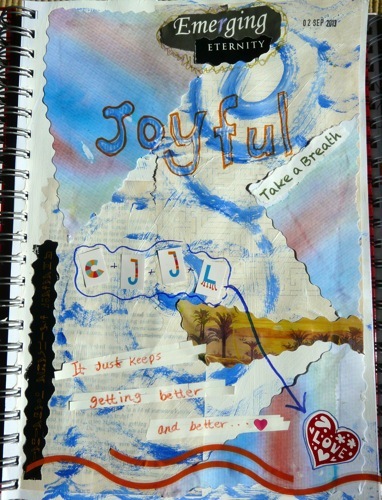 If you’re inspired to try art journalling, head over to Notes on Paper for lots of examples, ideas and exquisite photos. 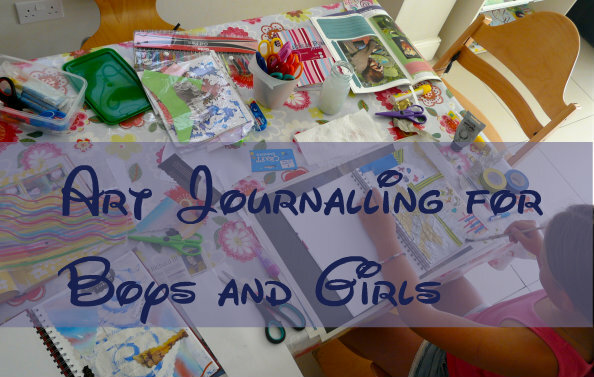 Update: to see how our art journaling style has evolved – and how boys can art journal too – see Art Journaling for Boys and Girls. 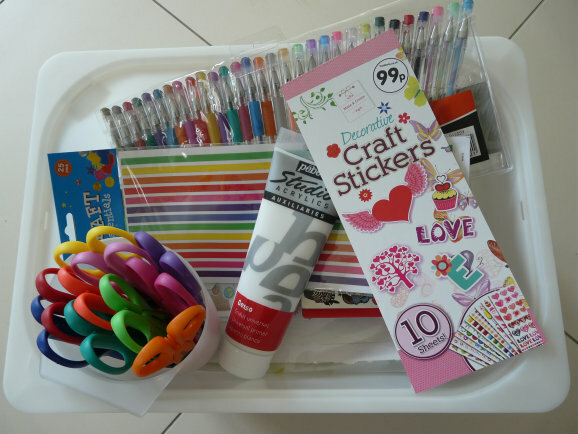 For more art and craft ideas, visit Hobbies and Handicrafts at Highhill Education. For more hands-on projects, visit Tactile Tuesday at Educating Laytons.